When you buy a new pair of boots, it’s highly unlikely that they’ll fit perfectly right out of the box. A few aches and pinches are common, especially around the heels and sides of the toes. You’ll need to break them in first, before you start wearing them for extended periods. Otherwise, your feet could be in for a few VERY rough and painful weeks. over the next 2 minutes we are going to show you how to break in your new boots like a PRO – if you do it correctly, blisters and stiff work boots will be all but a distant memory. 1) The Stick Treatment: Insert a broom or mop stick into the boot, aiming the stick towards the area (toes or heels) that pinches or is tight. Then, gently but firmly bend the boot over the stick so the leather stretches out of the sole in the affected area. You’ll see a slight outward discoloration of the leather, which indicates the boot has stretched. 2) The Hot Water Treatment: This is how the men/women in the military do it. Immerse the new boots into a bucket of warm water, and let them sit for around 30 minutes or so (more if the boots are made of finished leather). Upon saturation, empty the excess water from the boots and then wear them (with socks on!) for another 30 minutes to an hour. NOTE: Make sure that you read our waterproofing guide before you do this. 3) The Cold Water Treatment: Pour cold water into a Ziploc bag, and release excess air from the bag before sealing it. Insert the bag into the boots, making sure the water is angled in the direction where the boots pinch. Stick the boots in the freezer and let lie overnight. The water turns into ice, expands and stretches the boots. Pull out of the freezer and let the ice melt completely before removing. 4) The Oily Treatment: Use Mink oil or other leather conditioner to liberally coat the outsides of the boots where they pinch. Leave overnight, and in the morning wipe off the excess with a cloth. The oil helps soften the leather in the area where it was concentrated, leaving the boot more comfortable to the wear. When it comes to breaking in boots, there’s no substitute to actually wearing them. However, if you attempt to wear a new pair of boots immediately, un-broken, it may take anywhere between 3 to 5 weeks for them to conform to the shape of your feet. During that time, you’ll be susceptible to blisters and corns. Using the tricks above could shorten that period to a matter of days. 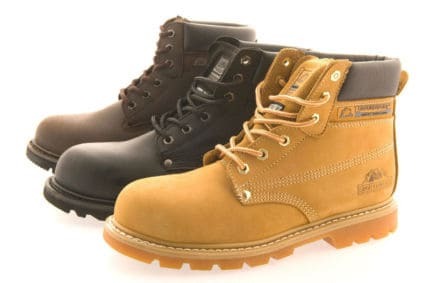 2) Buy boots that fit you fairly well even before you start the break-in process – some really comfortable work boots. 3) Don’t attempt breaking them in if you have problems with your feet: In-grown toe nails, nails that are too long, blisters, painful corns, plantar faciitis etc. 4) Breaking in gradually, over increasingly extended times, is better than doing a 12 to 15 hour stint of breaking in.